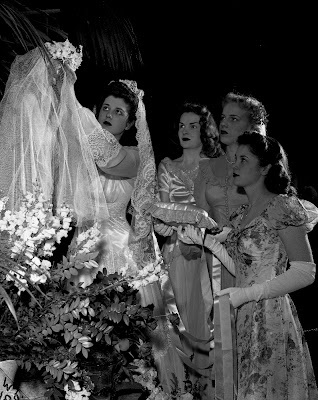 The May Queen of Mundelein College (Helen Walz) and her attendents place a veil and wreath of flowers on the head of the statue of the Blessed Virgin at their University May 24, 1945. Mundelein College was the last private, independent, Roman Catholic women's college in Illinois. Located on the edge of the Rogers Park and Edgewater neighborhoods on the far north side of Chicago, Illinois, Mundelein College was founded and administered by the Sisters of Charity of the Blessed Virgin Mary. In 1991, Mundelein College became an incorporated college of Loyola University Chicago and has since become completely affiliated. Mundelein College was located just south of Loyola's Lake Shore Campus.